All of the General Conference talks are available at the Church web site shortly after the session ends, either for online streaming, or for download, as video or audio media. Talks are transcribed to text and available for reading or downloading shortly after the Conference. I failed to take notes during the Women's Session, though my mom gave me permission to watch. President Henry B. Eyring: "Is not this the fast that I have chosen?" President Eyring recalled finding a donation slip inside of an old book of scripture, with one dollar indicated as the amounts for each donation category. It was the equivalent of the widow's mite. President Boyd K. Packer: "The Plan of Happiness"
A cookie and a kiss. Marriage and family within the bounds of gospel teaching are the Plan of Happiness. Sister Linda K. Burton: "We'll ascend together"
Elder Dallin H. Oaks: "The Parable of the Sower"
The stony heart. Beware of playing games during the Sacrament. Do things that make our harvest plentiful. Elder L. Whitney Clayton: "Choose to believe"
God does not force us to believe, He invites us. Elder L. Tom Perry: "Why marriage and family matters"
Marriage is still the ideal. 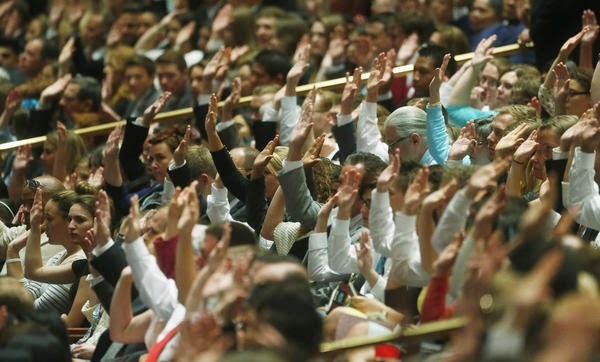 During the beginning of this session, President Uchtdorf conducted the sustaining votes, and financial audit and statistical reports were given. 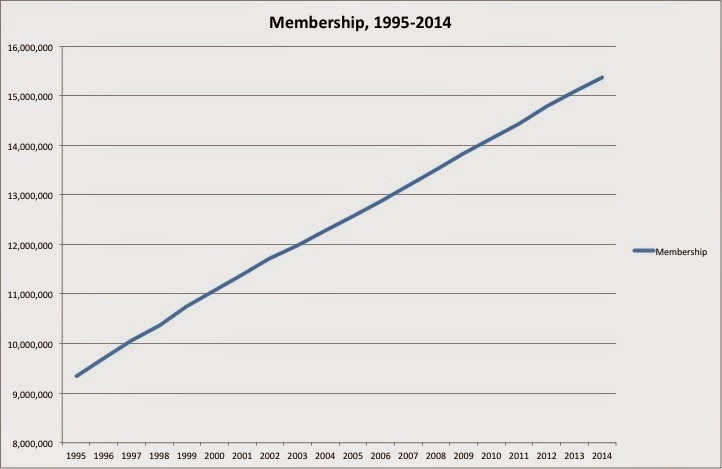 Interesting to note trends in growth of membership report. President Uchtdorf responded calmly to dissidents shouting dissenting votes during the sustaining of General Authorities. He was unperturbed, noted their objection, and at the end of the proceedings, instructed them to bring their objections to their local Stake President. The disturbance indicates a basic misunderstanding of the principle of Common Consent. Although it is intended to be a democratic process, it was not implemented to facilitate demonstrations or protests. The protocol is intended to help settle disputes peaceably and without rancor. Most Church members recognize the sustaining vote as an opportunity to fulfil the obligations bound by sacred covenants. Elder David A. Bednar: "Therefore they hushed their fears"
The peaceable things of the Kingdom. Elder D. Todd Christofferson: "Why marriage, why family"
Quote from Bonhoeffer, "The Office of Marriage". Elder Wilford Andersen: "The music of the gospel"
"I could teach you to dance, but you have to hear the music". 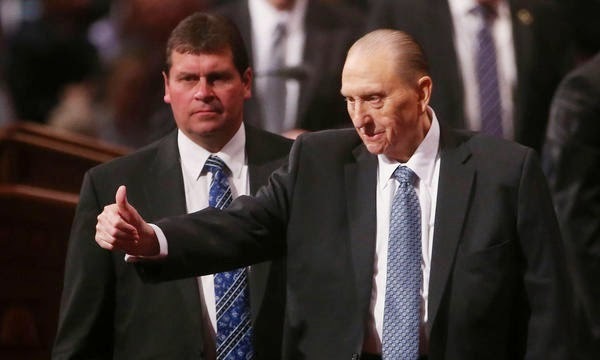 Elder Dale G. Renlund: "Latter-day Saints keep on trying"
"Twas I, but it's not I". God is disappointed when we fail to recognize the struggles of others. Elder Michael T. Ringwood: "Truly good and without guile"
Blessed is he that endures to the end. Elder Quentin L. Cook: "The Lord is my light"
Sunflowers grow in inhospitable soil. We flourish and become beautiful as we follow the sun. Elder M. Russell Ballard: "The greatest generation of young adults"
RM doesn't mean "Retired Mormon". Elder Ulisses Soares: "Yes, we can and will win!" Brother Larry M. Gibson: "Fatherhood — our eternal destiny"
High time to examine our hearts, and make a course correction. President Dieter F. Uchtdorf: "On being genuine"
The Potemkin Village. We have left our first love. God has power to breathe life into you. It cannot happen if we hide behind a façade. 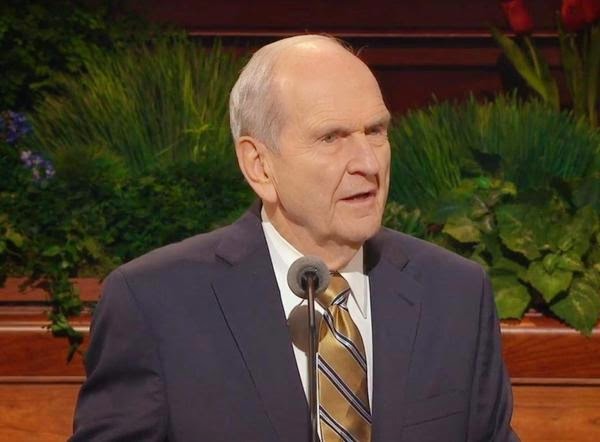 President Henry B. Eyring: "Priesthood and personal prayer"
President Thomas S. Monson: "The priesthood — a sacred gift"
Come, ye sons of God. Determine our duty. Military service priesthood interview. My nephew went, with a group of young people from his ward, to the Conference Center this morning before the session, to attempt to counteract some of the dissident protests being staged around the Conference. Rumored to be many gatherings planning to conduct noisy disruptive demonstrations. 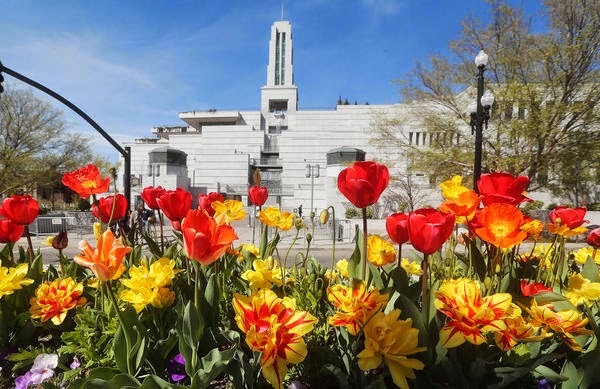 The counter group plans to loudly sing LDS hymns together to overwhelm and bury the tumultuous noise of angry dissenters. The Tabernacle Choir was accompanied by two ladies at the organ - something I have never seen before at General Conference. 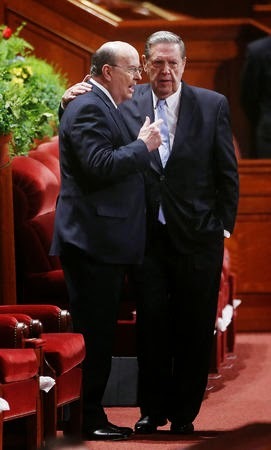 President Thomas S. Monson: "Blessings of the temple"
New temples in Haiti, Ivory Coast, Thailand. 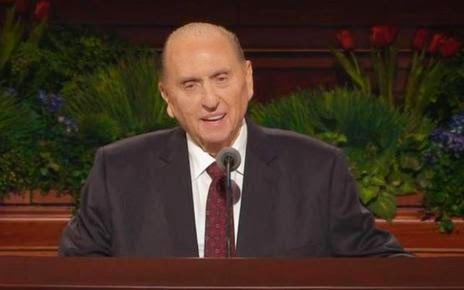 Though President Monson exhibits signs of age over the past several years, he gives no indication of serious infirmity, and his address was as enthusiastic and energetic as ever. This has been an issue of some concern in certain venues. I hope such doubts are pacified. Sister Rosemary M. Wixom: "Returning to faith"
A constant quest to learn "Why?" Church is not a place to put on a perfect face. Elder Jose A. Teixeira: "Seeking the Lord"
Life is not confined to a four inch screen. Bishop Gérald Caussé: "Is it still wonderful to you?" Children, to Bishop Causse: We have lived here all our life, and we have never been to the Eiffel Tower. Elder Brent H. Nielson: "Waiting for the prodigal"
How to respond to those who have lost their way. All of us are lost, and need to be found. Elder Jeffrey R. Holland: "Where Justice, Love and Mercy Meet"
A fictitious tree branch fails to distract. Brotherly hands helped me to safety. President Dieter F. Uchtdorf: "The gift of grace"
On this day, our lives changed. We grow from flawed and limited beings, by the Grace of God. Elder Robert D. Hales: "Preserving Agency, Protecting Religious Freedom"
Jesus used His agency to choose Heavenly Father's plan. Elder Kevin W. Pearson: "Stay by the Tree"
"Hang in there" is not a principle of the Gospel. Elder Rafael E. Pino (Spanish): "The Eternal Perspective"
Unless we step back a little we cannot appreciate the forest. Focus on a single jigsaw puzzle piece will not bring the entire picture into perspective. Interjected by President Uctdorf: Sorry, President Monson. I made a switch to my native language! Elder Neil L. Andersen: "Thy Kingdom Come"
If everything is going perfectly, just wait. Can you see the hand of God in your life? Our faith grows as we anticipate. The skeptics will be silenced. Elder Jorge F. Zeballos (Spanish): "If You Will Be Responsible"
Learn our duty. How could we be content with anything less? There was a musical interlude, with the Tabernacle Choir singing a Primary song, "Tell Me the Stories of Jesus, accompanied by two ladies at the organ! Elder Joseph W. Sitati: "Be Fruitful, Multiply and Subdue the Earth"
Fundamental attributes of our Divine nature. 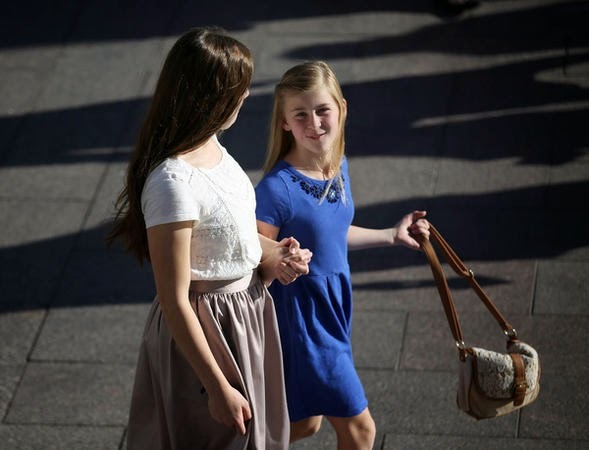 Elder Russell M. Nelson: "The Sabbath is a Delight"
How will I change? How do we hallow the Sabbath?